Building your own deck is a deceptively simple project that many homeowners attempt but the reality is, depending on the size and scope of the project, this is a task best left to experts in the field. 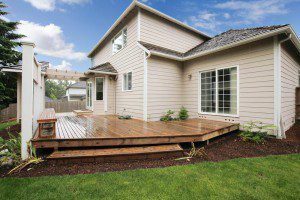 When planning your deck construction, there are several issues to keep in mind. Many communities require building permits and may place restrictions on the size and placement of your deck. The right professional will take the time to assess the scope of work, taking into account the size and complexity of the project, and walk you through all the different options available such as height and type of wood used. Placement of the deck is also important; your professional may suggest the best location in terms of structural support, but also to take full advantage of any existing view. Experts will also keep in mind the purpose of the deck: whether it’s simply an extension of a living room or an additional space that will be dedicated for entertaining. They can incorporate additional items such as an elevated seating area, separate grilling space or even planters for decorative landscaping. Many companies will also assess the existing house for structural integrity, and point out any issues that may occur. These professionals have extensive knowledge of deck construction, and can offer expert opinions as to whether your deck would work best anchored to your house, or as a freestanding structure. They can suggest a particular type of wood or incorporate a mixture of different woods and steel that will blend seamlessly with any existing design. Experts who perform this type of skilled carpentry follow all basic rules of construction and safety. The end result is a deck that’s safe and durable, and offers many hours of enjoyment and relaxation. Choosing a professional experienced in deck construction can provide peace of mind, meaning homeowners can be sure of a deck that’s structurally sound and satisfies all necessary codes and restrictions.